also spelled Humphris. 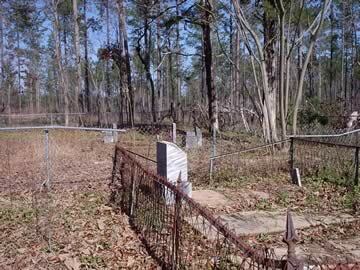 The listing of this cemetery was revised 2012 to reflect Ground Penetrating Radar of unmarked graves. From the Baldwin County Courthouse, go west on Hancock Street for 2 blocks or 0.2 mile (or the one large block containing Georgia College & State Univ.). Turn right on Clarke Street. Go one large block or 0.2 mile. Turn left onto Highway No. 22 west (Montgomery St.). Go 5.0 miles. Turn right on Old Monticello Rd. Go 6.3 miles. Turn right on Christmas Lane (unpaved). Go 0.7 mile. On the top of hill on left is gate. If open, drive in 0.3 mile, and on the right near very large trees are two areas of the cemetery, each enclosed in an iron fence. For a 8 X 14 inch PDF diagram of the cemetery, click here. The golden gates were open. A gentle voice said come. 12 graves found by ground penetrating radar, May, 2012. Through days well spent in prayer and praise In words and works of love, God led her feet by pleasant ways, To His blest light above. Middle name per TT. Only initial appears on gravestone. Info per TT. Not found in later indexes. Twas sweet to listen to the words that flow'd from thy dear lips, alas! now sealed in death.